The Best Alternative to Spanx Shape Wear in Toronto! Undergarments that visibly smooth stomach bulge, love handles and unwanted fat. 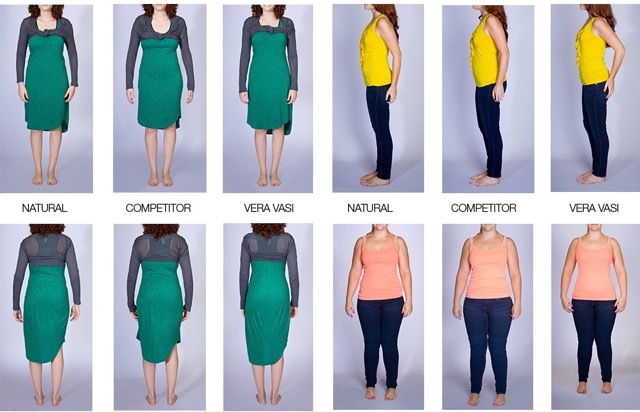 Vera Vasi Shapewear is the leading medical grade compression garment company in the world.The results of 19 years of scientific textile research has resulted in Marena’s patented, “F7 ComfortWeave” fabric that delivers the highest level of slimming power available. In fact, world renowned French plastic surgeon Dr. Yves-Gerard Illouz, found that only fabric with the compression range of 17 to 20 mm Hg (found in Marena’s F7 fabric) delivers true slimming benefits such as a reduction in the appearance of cellulite. Slims up to one dress size instantly. Engineered to provide the perfect balance of power and stretch in all directions, with unprecedented slimming power and wearing comfort. Keeps you cool and dry with COOLMAX® moisture management. Three-dimensional knit pulls moisture away from the body, and allows air to circulate close to the skin. Kills bacteria with built-in anti-microbial protection. COOLMAX® permanently inhibits the growth of bacteria, mold and mildew, leaving you with a fresh, clean feeling all day, every day. Smooths curves and promotes skin retraction. All “Vera Vasi” fabric is formaldehye-free, silicone free and latex-free. Clinically proven micro-massage fibres help naturally smooth your skin, with every movement. Reduces the apperance of cellulite. Favoured by new moms Post Pregnancy.